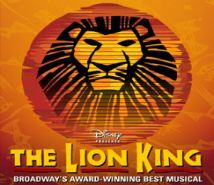 The Lion King is a Tony Award and Olivier Award-winning musical based on the 1994 Disney animated film of the same name with music by Elton John and lyrics by Tim Rice. Directed by Julie Taymor, the actors are in animal costumes as well as giant, hollow puppets. The show is produced by Disney Theatrical.